Looking back, I can’t say I had any major transformative goals for 2016 – none other than pushing through and passing all my units, anyway. Not that I’m one to fail units, but there’s always the fear of perhaps, one day, for whatever reason, doing exactly that. This particular anxiety has partially shaped my student experience, as I have placed greater importance on academic pursuits than on social activities. My social life (if it’s even useful to compartmentalise aspects of existence like this) is something that deserves more attention in the coming year(s). That said, it has been quite difficult to accept that, in fact, one can’t just spend all one’s time seated behind a desk, and have an exciting and fulfilled (student) life. Third Last Sentence of Final passage to The Road not Taken by Robert Frost, displayed on one of the buildings at the Humanities Faculty in Leiden. So while 2016 has taught me that I perhaps unnecessarily limit myself, it has been the realisation of this self-inflicted tendency to do so, that has resulted in some interesting insights into the many things that do bring me fulfilment. With the addition of some impulsive decisions, the absolute highlights in regard to this transformative self-acknowledgement, have been bonding with old friends in new European locations as well as my participation in AIESEC The Netherland’s Nour Project. In fact, the year seems to have come full circle, ending in a similar fashion to how it began, despite university very much taking on the impermanence of a kind of existential transiting station, an in-between here and there space. The Drummer by B. Flanagan at the Irish Museum of Modern Art (IMMA). Three days ago, I was reunited with my Singaporean school friend at Schiphol, after last seeing her in Dublin at the start of the year. During our time in the Emerald Isle, we wandered around various parts of Dublin which were still decorated with Christmas ornaments, and amongst other sites, visited the Irish Museum of Modern Art and Kilmainham Gaol. This festive season, she was keen to explore Amsterdam, with the additional company of her younger brother, on her way back to Singapore from Ireland. Similarly to rainy Dublin, we had a lovely day walking around the sunny yet chilly Dutch capital. We starting with breakfast near Dam Square, at which we exchanged memories of boarding school in Australia, and then spent several hours at the Van Gogh Museum. Afterwards, we bought some oliebollen (with apple filling and dusted with powdered sugar) for them to try whilst waiting for tram 2. Upon its arrival, we proceeded to make our way to an early dinner at Haesje Claes: a quant, Dutch restaurant, which made me rather nostalgic for childhood days spent with my Dutch grandparents in Arnhem. Second Last Sentence of Final Passage to The Road Not Taken by Robert Frost, displayed on one of the buildings at the Humanities Faculty in Leiden. Having known my friend for nearly twelve years, it was great to finally show her around my birth city and to share with her these fragments of my upbringing on location, in real life. Interestingly, throughout the day, it dawned on me just how influential sharing fragments and insights can be in terms of maintaining longterm relationships. There were things about my past experiences here in the Netherlands, which I had long forgotten, that were still very much reference points to how my friend perceived me as her school friend living here. Even though I had long moved on, she continued to give a certain permanence to my past. I suppose this is telling of the fact that in choosing to study abroad, I chose to (unintentionally) limit my family and friends, who should not be taken for granted, from fully sharing in my continuous, personal development. The formative lesson in this being, that these relationships cannot be expected to endure without continuous efforts to make them last, or else we all head off down our own paths, risking the loss of those most important to us along the way. Interior of Traditional Dutch Restaurant, Haesje Claes, situated on Spuistraat in Amsterdam. When I wrote my maiden post about coping with homesickness at the start of this academic year, I was very conscious of the fact that university in part functions like a transit station: we arrive in a place; we exchange information about ourselves; we influence each other; and, we all eventually move on to our next physical and/or mental destinations. For some this comes with ample rewards, for others it comes with disappointments. Experiences matter in terms of shaping our perceptions of a place and perceptions of our relationships with ourselves and with others. Our time here at Leiden is finite and change is inevitable. It comes down to embracing that impermanency and making the most of the opportunities and freedoms that the Netherlands presents to us. It comes down to giving ourselves the opportunity to grow whilst not losing sight of the interests, activities and relationships that brought us here and have given us a sense of permanence and fulfilment all along. Final Sentence of the Final Passage to The Road Not Taken by Robert Frost, displayed on one of the buildings at the Humanities Faculty. From The Netherlands then, I want to wish you, and your loved ones near and far, a prosperous and memorable 2017. Happy New Year/ Gelukkig Nieuwjaar! Hello, Sarah-Louise here. I study South & Southeast Asian Studies, including Hindi (नमस्ते), at the Faculty of Humanities. I am interested in identity formation, their politicisation, and social spaces, and for this reason I like to combine my own photography with storytelling. Feel free to leave a comment below, to request a blog topic or to approach me in person, if you happen to spot me on campus. For my full profile, please visit the Meet the Bloggers section of The Leidener. Great article ! I visited Leiden recently and when I saw the lines from the Robert frost poem on the campus my heart filled with joy. I’m looking forward to studying st Leiden next year and I appreciate your perspective from a student. Thank you! Wishing you all the best in your preparation for your studies here. Take care and perhaps see you around campus soon! Hi Ela, it’s been a couple of days and I promised to get back to you again. I haven’t been able to find anyone for you but the head of the team here at the Leidener suggested that you could send an e-mail to the course coordinator of the study programme with the same question. I hope that he or she will be able to connect you to current students enrolled in the programme. The contact e-mails can be found on the study programme page that I linked a couple of days ago. Feel free to contact me if you run into any difficulties with the application process. Best wishes to you from the Netherlands. Take care! 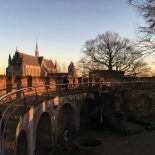 This entry was posted on December 30, 2016 by Sarah-Louise@TheLeidener in Living in Holland, Student Life, Travel.